Peerless’ solutions for industrial measurement include a complete line of pressure, temperature, thickness, level and flow instrumentation. Our ever expanding line includes Lumetrics, one of the fastest growing names in instrumentation. Whether it’s pressure gauges for oil refining, temperature measurement devices for chemical processing, or level measurement sensors for storage tanks, instruments are critical to prevent failure, enhance safety and maintain quality control in numerous industrial applications. Monitoring and controlling processes is necessary in in-plant environments, laboratories, and engineering offices. Whether you’re a plant operator, engineer, or scientist, accurately measuring and testing is a critical function in your work. Instrumentation can be installed anywhere in a system or process where there may be the likelihood of a change in either pressure, temperature, liquid level, flow rate, etc. or anywhere the system designer deems a necessary data point. When implemented in applications where trending and predictive maintenance are performed, instrumentation provides key information to the operator/maintainer as to the condition of the system or process. For example, high pressure differential across a filter will indicate the need for cleaning or changing of filter elements. OR, minimal change in temperature from inlet to outlet of a heat exchanger might indicate a restriction in flow of the cooling/heating medium. 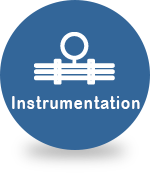 Instrumentation is imperative in any industry where pressures, temperatures, liquid levels, flow rates, etc. are required to evaluate systems and processes. Producing over 40 million gauges, diaphragm seals, transmitters, and thermometers worldwide annually, WIKA has the most extensive product line in the industry. REOTEMP is a globally recognized ISO 9001-2008 manufacturer of temperature and pressure instrumentation, providing bimetal thermometers, pressure gauges, diaphragm seals, RTDs, thermocouples, pressure transmitters, compost thermometers, and related accessories. Ashcroft® transducers / transmitters, pressure and temperature switches, thermometers, test equipment, and extensive variety of pressure gauges are manufactured in ISO 9001 certified facilities. Industrial and commercial pressure gauges in sizes from less than 1” to 12” in pressure ranges up to 100,000 psi. OPW manufactures a full line of ISO Rings and Flow indicators for some of the most demanding process industries. Along with a full line of economical pressure and temperature instrumentation, Weksler manufactures a full line of chart recorders for pressure, temperature and humidity. Eliminate pressure instrument failure due to hydraulic or pneumatic shock. Smooth out pressure impulses and fluctuations Remove harmful solids from actuating fluid. Assure steady average pressure readings. The key to the superior performance and efficiency of Chemiquip Pressure Snubbers is the corrosion-resistant porous membrane used as the snubbing element. For more than 50 years, Alloy Engineering has specialized in the manufacture of thermowells for all types and makes of thermometers and temperature sensing elements.